In any other year, today we would be celebrating the Annunciation, and Mary's YES to God's incredible call. 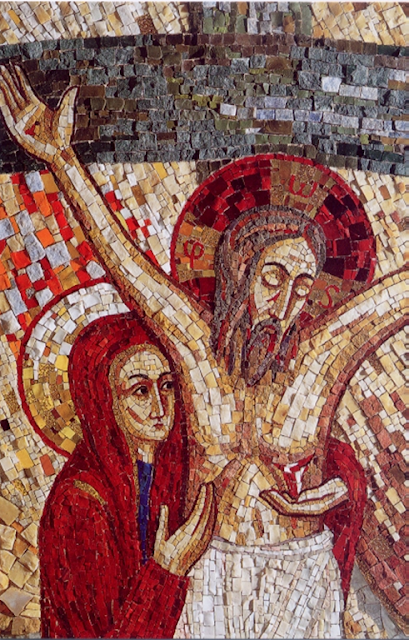 Instead, today we stand with Mary by the Cross, quietly commemorating the final, grievous outcome of that YES: Jesus' YES to suffering and death. Luke's account of the Annunciation ends somewhat abruptly. Mary gives her consent, and then, in the same verse, come five words: And the angel left her. That's it. One minute the room is filled with an angelic presence, with the glory and radiance of God; in the next minute, the angel has gone, all seems back to normal... except that "normal" has now been changed forever. And Mary is left with a treasured memory, with the certainty of God's promise and the life of God within her. And over time even that would have changed, clarity and inspiration deepening even as they fade. But now, did Mary remember that angel, that momentous event, as she stood at the Cross, watching life drain from her Son? Did she ask herself - ask God - what had become of the promise that her Son would be holy, Son of the Most High, whose reign would last forever? Did she hope for a divine rescue? Or did she simply cling, in desperate, uncomprehending faith, to the deeper truth the angel had revealed?